Weinböhla is a popular resort just outside the city of Dresden. The proximity to the Saxon Wine Route and famous sights between Meissen and Moritzburg are always worth a trip. The Elbe Cycle Path is about 5 minutes away from the house and invites for cycling, jogging and walking. Beer gardens, restaurants and winemakers are looking forward to your visit. The house is quiet and still centrally located to the town center. 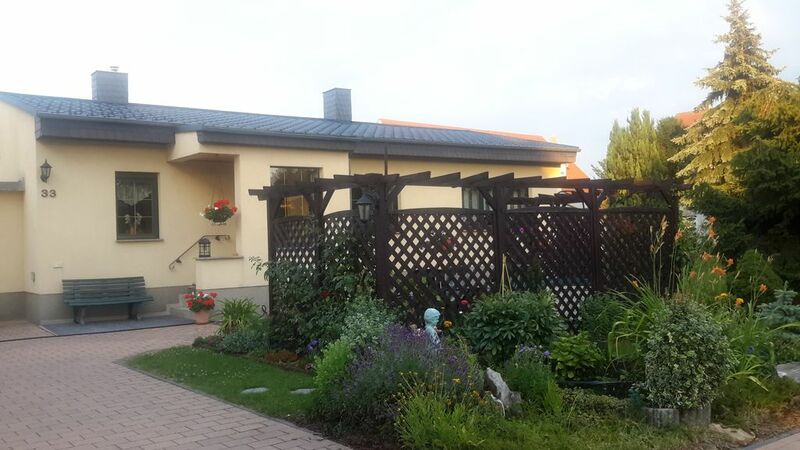 It is located in a blooming garden with its own sun terrace and parking for your car. It offers a living room with large windows for a view of the garden, furnished with modern furniture, sofa bed (for 3rd and 4th Person on request), flat-screen TV, DVD player and radio. The cozy bedroom is furnished with a comfortable box-spring bed. The kitchen is fully equipped and offers seating for 4 people. Not a holiday home; more a home! From our (early) arrival until our departure, we loved staying here. The build spec is of the highest standard and the decor within the house is tasteful, spotlessly clean, very sturdy and functional. Seriously, the furnishings, fixtures and fittings are better than ours at home! Although Europe on the whole has been going through a particularly dry few months, the plants in the garden were still looking good and in bloom. The pool was a welcome relief after our days out in the hot sun and we were made to feel welcome to use it whenever we wanted, even if Sybille and Karl were using it, so we used it when we wanted to! The neighbourhood felt very safe and the local people were very friendly and helpful. We have very little German and most of them have a similar amount of English, but somehow we got by! Weinbohla is a small, friendly town with the amenities that you need. We didn’t go to the lido (mainly because of the pool at the house!) but it looked very inviting! Sybille recommended the keulscher-hof restaurant by the church in town, so we walked there (10-15 minutes) and had a delicious meal with friendly service too. Weinbohla is a short drive to Meissen which is definitely worth a visit for at least a day. The surrounding area has beautiful countryside and is a refreshing break from the hustle and bustle of cities. We loved every minute and when we visit the region again, we will stay here. This cottage was beautiful. We enjoyed our stay. Our hosts were friendly and helpful. The facilities and location were great. We recommend this accommodation to anyone traveling in the Dresden area. Tolles Haus, dem es an nichts fehlt! Liebe- und geschmackvoll eingerichtet, viel größer als es auf den Bildern wirkt und super sauber! Zur Begrüßung standen eine Flasche Wein und ein Strauß Blumen bereit - danke! Der Hammer war das Bett - selten so gut geschlafen, wie darin! Super!!! Das Ferienhaus und der Garten sind super! Topausstattung und super sauber. Sehr nette Vermieter. Toll eingerichtet, es fehlte an nix. Super nette Vermieter. Unsere Jungs (3 und 5) fühlten sich auch pudelwohl. Viele Grüße an die Familie Berndt nach Weinböhla. Unterkunft, Vermieter und Urlaubsort waren super!!! Die angegebenen Preise gelten für 2 Personen. Für die 3. und 4. Person berechnen wir je 20 €/Woche .